If the inboard friction surface of the brake rotor is not accessible, reposition and support the caliper with the brake pads. Refer to Front Disc Brake Pads Replacement. Clean the friction surfaces of the brake rotor with denatured alcohol, or an equivalent approved brake cleaner. Light surface rust can be removed with an abrasive disc. Heavy surface rust and/or pitting must be removed by refinishing the brake rotor. 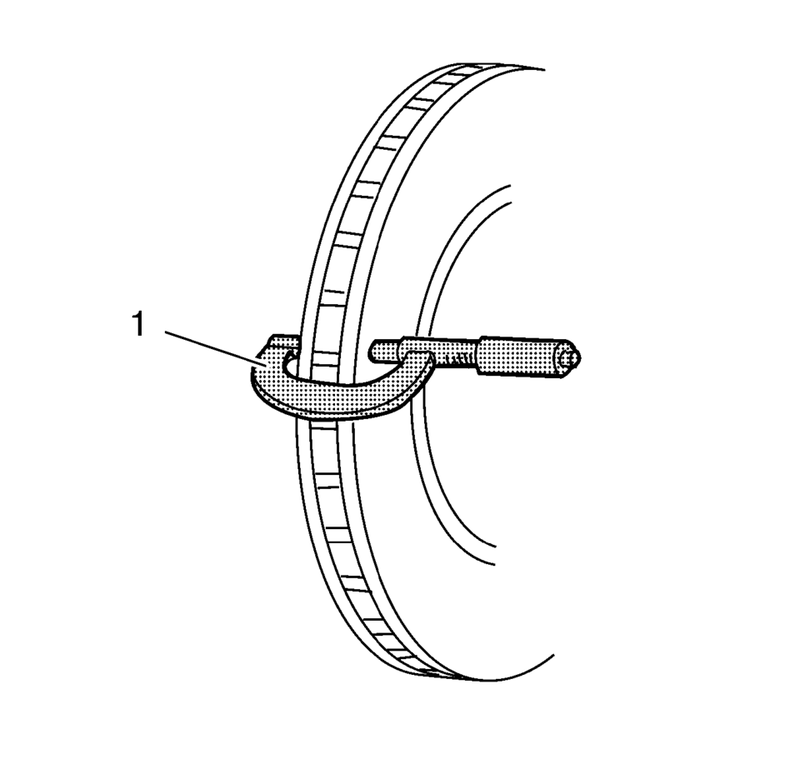 If the friction surfaces of the brake rotor exhibit one or more of the braking surface conditions, the brake rotor requires refinishing or replacement. Using a micrometer (1) calibrated in thousandths-of-a-millimeter, or ten-thousandths-of-an-inch, measure and record the scoring depth of any grooves present on the brake rotor friction surfaces. Brake rotor maximum allowable scoring: 1.50 mm (0.059 in) . If the brake disc rotor scoring depth exceeds the specification, or if an excessive amount of scoring is present, the brake rotor requires refinishing or replacement.